Migraine affects—and is affected by—the senses of the ears, eyes, nose, and taste buds, and even the digestive system. Migraine is also linked with various other conditions, one of which is motion sickness. A 2005 pilot study suggested that a Triptan medication commonly used to treat migraine could reduce motion sickness caused by vestibular stimulation. Recent findings shed more light on the relationship between migraine and motion sickness, and offered insights into the development of migraine attacks. People develop motion sickness when the brain receives conflicting messages from two or more motion detectors. Typically, this happens when the inner ear identifies one direction or speed of motion, while the eyes identify another. It’s usually caused by riding in a vehicle of some sort, but can also occur when you’re standing still and the scene around you is moving. The result is dizziness, fatigue, nausea, pallor and occasional vomiting, which are symptoms common to migraines as well as motion sickness. The brainstem is structurally a very complex area of the body, and it contains a multitude of fibers that all work together to regulate the bodily functions you need to survive. It processes input from our senses and controls pain messages to the brain, and when it experiences disturbance it can increase your vulnerability to a migraine attack as well as your susceptibility to motion sickness. Both migraine and motion sickness involve abnormal activity in the brainstem, which indicates the common symptoms share the same neural circuits. When the brainstem is disturbed by a stimulus, it can respond by triggering either a migraine or motion sickness. Patients with brainstems that are easily upset are therefore vulnerable to both conditions. This kind of disturbance isn’t the only reason for migraine attacks, but it is the cause of a particular type of migraine. Sufferers usually get the conditions separately, although in rare cases patients experience them at the same time. A 2012 study showed that motion sickness is a condition often associated with migraines that are accompanied by vertigo, dizziness or imbalance. When a migraine conforms to International Headache Society parameters of “a balance disorder with migraine symptoms during episodes”, it could be diagnosed as a vestibular migraine. 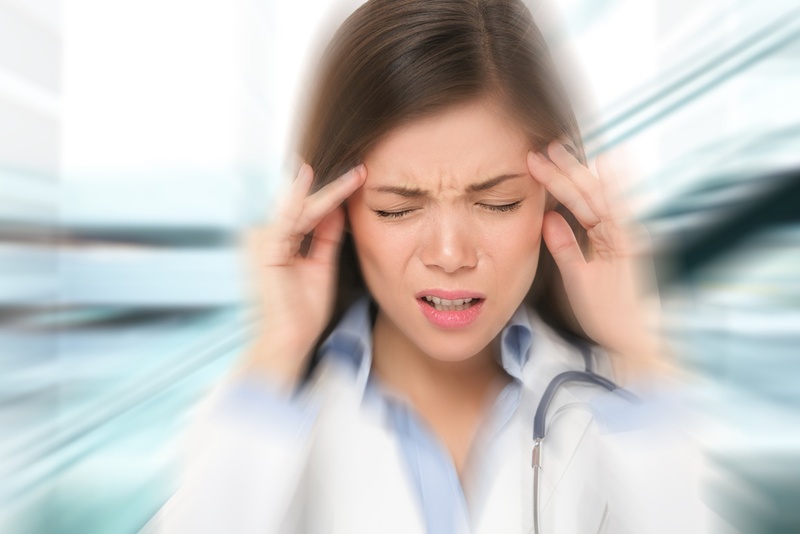 The most upsetting aspect of these migraines for most patients is the dizziness, rather than headache pain, with some sufferers reporting a spinning sensation, while others say they don’t even feel as if they are “on the ground.” The attacks can last from a few seconds to several hours, and often cause nausea or vomiting. Serotonin is a naturally-occurring chemical produced in our brain, bowels and blood platelets. As a neurotransmitter, it conveys messages between cells and regulates bodily functions, like our sleep-wake cycle, bowel movements, blood clotting and internal clock. It’s believed to contribute to well-being and happiness and plays a role in mood changes and anxiety. A serotonin imbalance is also believed to be instrumental in developing motion sickness. The number of migraine patients who suffer from motion sickness leads scientists to believe that low levels of brain serotonin might also be responsible. The methods of treating motion sickness are similar to those for managing migraines, and consist of a combination of preventive measures, lifestyle and environmental changes and medications. Watching the food, drinks, and alcohol you consume. Avoid items you know don’t agree with you. Limit your quantity of heavy, spicy or fatty foods, which can make motion sickness worse in some people. Skipping foods with strong odors can also help to prevent nausea. Choose a seat where you will be the least aware of motion. Always face forwards during road or rail travel. When flying, choose a seat in the most stable part of the airplane in the center over the wing. On a ship, the lower level cabins located in the center are the steadiest. Don’t read while traveling, and identify a focal point that moves at the same speed and direction as your body to fix your eyes on if you start feeling queasy. Stay away from others who feel ill and make sure you can feel moving air from a vent or window. Over-the-counter products usually give some relief, and meclizine such as Bonine, Antivert, and Dramamine can help for mild cases. Patients with severe attacks that prevent them from traveling could benefit from prescription medication such as a scopolamine patch. Triptans are commonly prescribed for migraine sufferers, and since certain triptans benefit motion sickness it’s important to tell your migraine doctor if you experience this. Anti-depressants called selective serotonin reuptake inhibitors (SSRIs) are often prescribed to treat depression, because a proven link exists between migraine and depression. These medications aim to limit the reuptake of serotonin in the brain, to keep levels higher than they would be naturally. This can benefit sufferers of both migraine and motion sickness, whether you are susceptible to both conditions or just one of them. Some motion sickness patients do well with therapies such as meditation, relaxation techniques, and biofeedback training. If you suspect your motion sickness and migraines are linked, practicing options such as massage or acupuncture may help you to avoid episodes or to reduce their severity once they begin. As always, following a healthy diet and including some appropriate exercise in your lifestyle strengthens your ability to deal with these conditions, and herbal or homeopathic remedies may bring you some relief. Migraine patients know just dealing with the headaches and other symptoms can be challenging, and adding motion sickness to the list is something most people can do without. Scientists are working hard to find new treatments for migraine, and since the link with motion sickness is now on the radar we hope an effective solution for the condition will be found soon.